A lot of things aren’t made quite like they used to be. And it’s fair to say this applies perhaps the most to children’s toys. With today’s kids’ playthings are often made out of cheap (and quick-to-break) plastic, many parents are thinking back to their own prized childhood items that were built tougher, and with more care – some of which were hand-me-downs from their own parents. The big difference between toys back in the day and now? Back then, toys were more commonly made of wood – a sturdy material that also just feels good in your hands. But instead of bemoaning how they don’t make toys like they used to, take a trip down memory lane with five classic children’s toys made out of wood. 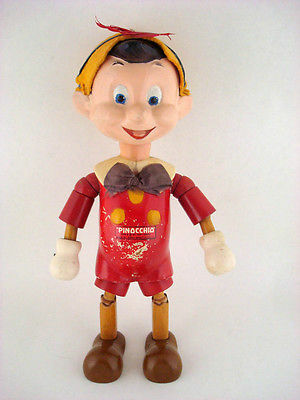 Coming in about 12” tall is this classic wooden doll of the boy who couldn’t tell a lie. One neat feature of this toy is that it is what toy experts call “jointed” – meaning it has limbs that can be manipulated and moved, letting it take on poses or expressive itself. Here’s a classic type of toy that you can still find in children’s shops. 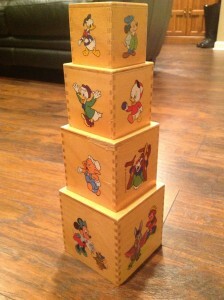 But unlike the modern version of the nesting block (which can be stacked up or fit inside themselves, Russian-doll style), this lovely Disney-character item is made of hardy wood. This is unique. 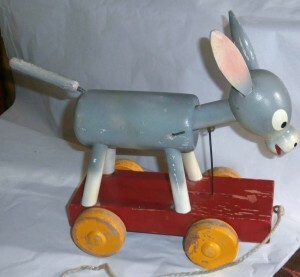 A vintage pull toy made in Germany. The trick with this mechanical wooden toy is that when you pull it forward the head and tail bob up and down. Here’s a more recent vintage American take on the classic pull toy. This Donald Duck figure made by Fisher-Price in the 1950s brings one big innovation: sound. When pulled, this toy not only moves its arms and legs but also makes a quacking sound. The riding horse is a classic toy popular with both boys and girls. 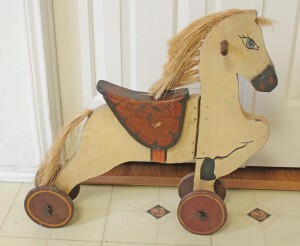 This art-deco style wooden horse even features a hinge letting the front part of its body turn left or right – adding a bit of fun for the rider.